Many parrots who have a trusting relationship with us enjoy being scratched on and around their heads. They particularly enjoy this as this area is difficult for them to reach when preening and may become clogged with pin feathers and dust. These scratching sessions are also good for us (the humans) as research suggests that scratching or patting an animal reduces our stress levels, lowers our heart rates, and feels good! If the parrot moves away from your touch, respect this and don’t move your hand closer to the parrot. Scratch him on top of his head for 2 seconds and stop, if he pushes your hand for more scratches, then continue for another 2 seconds and so on….If he doesn’t push your hand for more scratches- give up for now. If the parrot normally comes towards your hand to step up for removal from his cage and this time does not, then don’t pursue him around the cage. He has made his decision not to come to you. Respect this. Never force yourself onto a parrot. 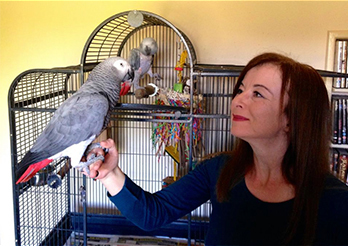 Never, ever allow strangers or visitors to your home to try to touch your parrot or approach them to stare at them- train your visitors to ignore your parrot. Remember that parrots have “off” days – just like us! Also remember that they are as emotional as two year old human children with a tin-can opener for a mouth. Don’t take rejection personally. With some patience and understanding, the “happy”, “friendly” parrot will return….just wait!